Well, hello there! I'm Lesley, the blogger behind By the Porchlight! I've been blogging for almost a year and am finally getting the hang of it. I love chatting about creativity and diy, good reads, good deeds and all sorts of adventures. Thanks so much, Chantilly, for letting me hang out here today! I've recently discovered Polyvore. I friggen love this tool! And since I, clearly, look for any excuse to use it, I've put together for you a few of my favourite things. And since I've had a lot of time to devote to my hobbies lately, I'm going to be giving away a cat. Oh wait, sorry. That's another giveaway I'm running somewhere else. I've got this cozy little cowl to give away to one of Chantilly's readers! It's handmade by yours truly, is super cozy and will look great on all your beautiful selves! ♥ Be a follower of By the Porchlight blog. ♥ Comment saying you did. ♥ Be a follower Chantillysongs blog. ♥ Like By the Porchlight on Facebook. ♥ Tweet about the giveaway, utilizing my username, By the Porchlight's username, and the link. 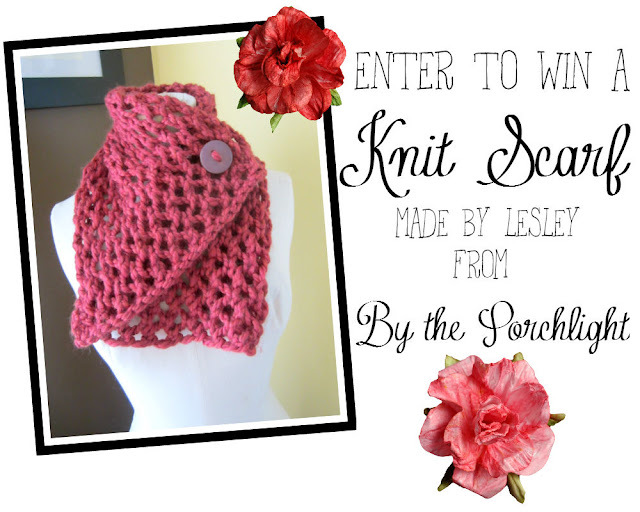 Example: "Win a gorgeous cowl neck scarf from @bytheporchlight on @chantillysongs! (then the link)"
The giveaway is open only to the US and Canada (international okay if you pay the shipping) and ends on Thursday, February 7th at Midnight EST. The winner will be picked at random and announced a few days later. Good luck! I hope you'll pop by By the Porchlight and say hi! Do you know how some certain pieces of clothing can remind you of specific times in your life? Well, me and this dress have some history together. I thrifted it back when my parents were living in Maine. Even though I think it's a cute, 90's inspired print, I used to wear it a lot during some of my more depressed days, so it has that association for me. Also, I've since lost some weight and it's a little too roomy. Honestly, this dress was in my "get rid of" pile recently... but I decided to rescue it for one last hurrah. To be quite honest, one of my favorite things about this outfit is the socks :P I ordered a few colors from Show Your Legs on Ebay, and I must say, I dig them. The material unfortunately doesn't feel like cotton (even though supposedly, it is.) But they are sturdy, comfortable, and I feel like colored socks (much like colored tights) are an easy way to jazz up an outfit. If you order a few pairs and save on shipping, they're a pretty excellent deal! Anyway, that story really has nothing to do with anything, other that I'm holed up in my apartment with little more than cupcakes to keep me company. I co-organized this music-networking event on Wednesday night with some friends/ contacts, and it turned out awesome!! ...except that talking in a loud bar for five hours really isn't the ideal way to treat your vocal cords :( I woke up with a sore throat and feeling sick. I'm hoping to take it easy on myself in the next couple of days, with lots of tea and rest! In the meantime, I hope you'll enjoy a sponsor feature I've got planned for this weekend, and mayybe even an edition of Sunday Songs. By the way... just finished up season 4 of the Wire. Really sad, but equally great. A few days ago, a lady on the train with mint green nails caught my eye. It reminded me that that's my favorite color, so I copied random-train-lady, and painted my nails the same. It's Mint Candy Apple by Essie. I know it's not a "winter" color. And I know it's not the best paint job. It never is. I'm a pretty sloppy nail painter, if I do say so. But looking at my hands now makes me happy. I sat on my windowsill and did my nails while looking out at my street, and it was the frigging best feeling. For no particular reason. It just was. I have chronic anxiety and stress... So moments like these are unexpected, beautiful, and such a relief. I wish I could explain it... and I guess capturing these moments is what this blog is supposed to be all about. But no matter how many inspiring images I post, it doesn't come close to those quiet few minutes I experienced with myself and the Universe. Real life. And maybe real life is un-captureable. Something simple as sitting on a windowsill is all the healing I'll ever need. And the joy it brings is something I'll never be able to fully express. I guess even if I tried to explain, only I'll ever know what my sloppy painted nails meant to me. Maybe it's better that way. That way, the moment will always be mine. Maybe it's not meant to be shared.